It looks like they are using the old fascia as it has a DVD slot and states the buttons don't work. Does anybody know which MTC this will be (I have asked but no reply)? if it is like the 8 inch universal I have, it will not be MTC at all, it will have a super long MCU name, but no mention of MTC, and ends in "Newlap"
Joying units are NOT MTC. The Joying unit will have an FYT5009 SoM. Thanks for the help all, ordered will give feedback when I've set it up. Ive done over a month of no music now so almost anything is welcome. Luckily ive been on the train a lot so haven't had to endure the sweet diesel clatter for too long each day! I'm happy with it, run mostly Waze, and spotify in online/offline mode. My E46 has one FAKRA connector to the vehicle harness, the provided adapter is a two FAKRA system to the unit with a blue 12V wire (ANT power). This is for older vehicles, with an older antenna amplifier that needs 12V from the radio. connecting the wrong of the identical FAKRA connectors and you have 12V sent back to the amplifier which might destroy it.... I measured so that I connected the right FAKRA connector and did not use the blue 12V cable. Still I have terrible radio reception! So I ordered an extra ANT-208 antenna amplifier, Ill see if it makes a difference when it turns up. Will let you know if i get some better reception with the ANT-208. BT works good, except sometimes the other person on the call don't hear me well on the external mic, i think it is just noise from the road. BT tethering does not work out of the box as BT settings are removed from settings.apk, I will replace the APK with a ASOP built one for BT tethering. This is for older vehicles, with an older antenna amplifier that needs 12V from the radio. connecting the wrong of the identical FAKRA connectors and you have 12V sent back to the amplifier which might destroy it.... I measured so that I connected the right FAKRA connector and did not use the blue 12V cable. So wait - if I connect the blue wire to the cables, and connect the wrong FAKRA connector (I actually tried both!) I will destroy my antenna amplifier because it's feeding in a 12V power supply? I thought, that the blue cable is for transmitting the radio signal back to the headunit. How is the signal supposed to go back otherwise? I don't have any other connectors in the front - the antenna cable including it's FAKRA style connector is in the trunk. Please beware that the antenna amplifier in our E46 car, normaly starts automatically. Look at the diagram, pin 16 uses a 12 volts signal to you're antenna amplifier. 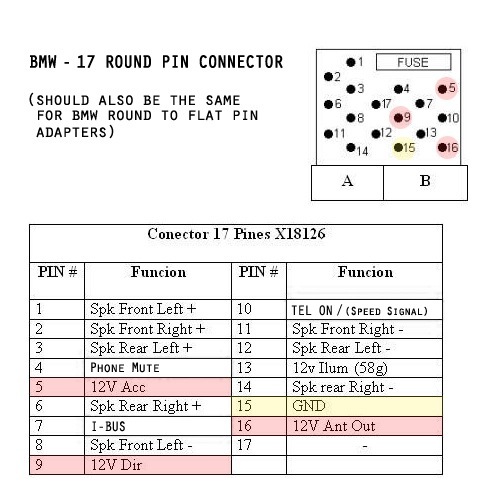 what you could do is to take out pin 16 out of the pin connector and connect it directly with the blue wire of the radio or take a piece of wire and make a bridge from pin 16 to the 12 volt on pin 5. Otherwise, a bad reception could be caused by bad contacts with the antenna in the rear window by dust or moist, try to clean it with dry air (like for pc's) if nothing works you have to replace the antenna amplifier. I also tried the blue wire and the "wrong" fakra connector connected, sending only 12v back to the amp, no signal. But I tested the OEM radio after and it worked so I didn't break the antenna amplifier fortunately. I left the pin 16 as it is for 12v back to the antenna amp via the "external speaker amp power output", brown/white if I remember correctly that is connected to pin 16. I measured it under load and it was 13V so no need to re pin it to use the blue wire instead which has more current out. I could also hear that the signal was cut off when i disabled AMP Power in the settings menu, so the power to the antenna amp works as it should, but not enough sensitivity in this radio, therefore I'm waiting for the ANT-208. From what I've understood we still need to connect this big clunky metall antenna plug into the headunit - right? If that's the case I'm afraid I have a problem. I had to buy the 5m extension harness, since my X5 had the factory NavSat which has all the original connectors in the trunk, under the spare tire. Even though I have the antenna adapter with the FAKRA plugs, I have no way to get that big metall connector to the headunit in the front. Looks like you have to route a long fakra extention cable all the way to the front, or try to fit a small antenna somewhere in the front.